This is a kinda funny combination out of a fish bone and a very rare pterosaur bone. 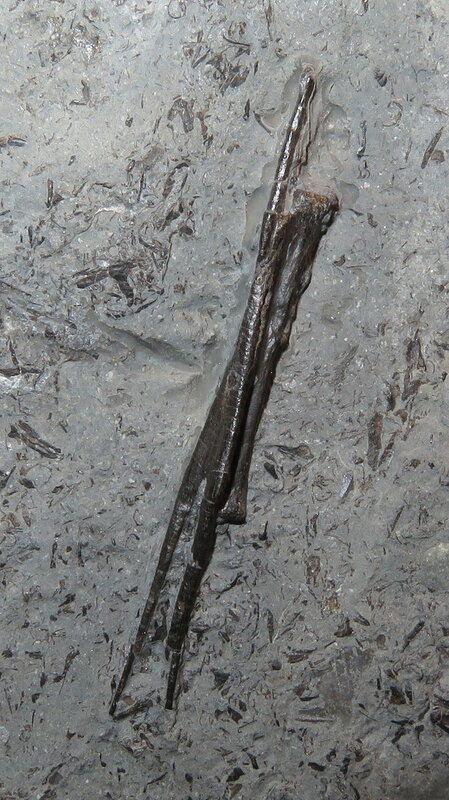 The fish bone is the bigger one (5 cm long) and is lying on the top of the pterosaur bone. The piece comes from the quarry Kromer near Holzmaden (Lower Jurassic). Are you going to show it to a pterosaur specialist? Did you see this album? It's from a friend of mine, who collects every weekend in Holzmaden. Maybe I would show a better preserved and larger pterosaur bone to a specialist but this one isn't an important find. There are many better pterosaur bones from the area of Holzmaden... my target is to find a beautiful pterosaur tooth! I just did - thanks for showing it to me; those are some wonderful specimens! !